Members of AIRA's Board of Directors initiated in 2011 the idea of a scholarship fund named in recognition of Executive Director, Grant Newton, for his life–time contribution and support of the Association. At the 29th Annual Conference in Chicago, June 2013, representatives of the Board surprised Grant by announcing the AIRA Grant Newton Educational Endowment Fund and presenting an opening contribution of $50,000 in his honor. The Mission of the AIRA Educational Endowment Fund is to further educational programs and funding of research focused on the areas of accounting, restructuring and insolvency including establishments of scholarships; sponsorships and encouragement of research and educational forums; education of judges, court personnel and governmental and other not-for-profit personnel; and providing other projects, materials or educational benefits to the bankruptcy and insolvency community. 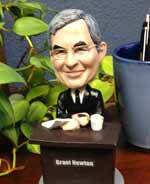 As part of a special fundraising campaign, contributors of $200 or more will receive a limited edition, hand painted Grant Newton bobblehead.